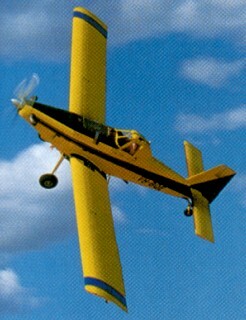 The Air Tractor AT-802 was designed primarily for the air tanker role. It was the first single engined fire fighter (as the AT-802F) to be designed from the ground up and with a similar hopper capacity to the twin engined Grumman S2F’s used by the Californian Division of Forestry. The AT-802 is, in appearance, an enlarged AT-503. The length is 3l feet and the wingspan is 58 feet. The 800 gallon hopper also incorporates computer controlled hopper doors to drop the load of retardant as required. The first dual cockpit AT-802, N802LS, was flown in November 1991, and was fitted with a P&W PT6A-67R of 1424 hp. By the time the aircraft was ready for production, it was certified for the installation of a PT6A-4SR or -6SB, both of 1173 hp. A single seat version, the AT-802A, N 1558W, flew in June 1992, fitted with a -6SB turbine. The empty weight for the single seater is 6200 lbs and they both have an operating weight of 16000 lbs. The introduction of Hoerner wingtips increased the span to 59.2 ft and a 2 in extencion of the engine mount was incorporated to ease the C og G limit on the two seaters.